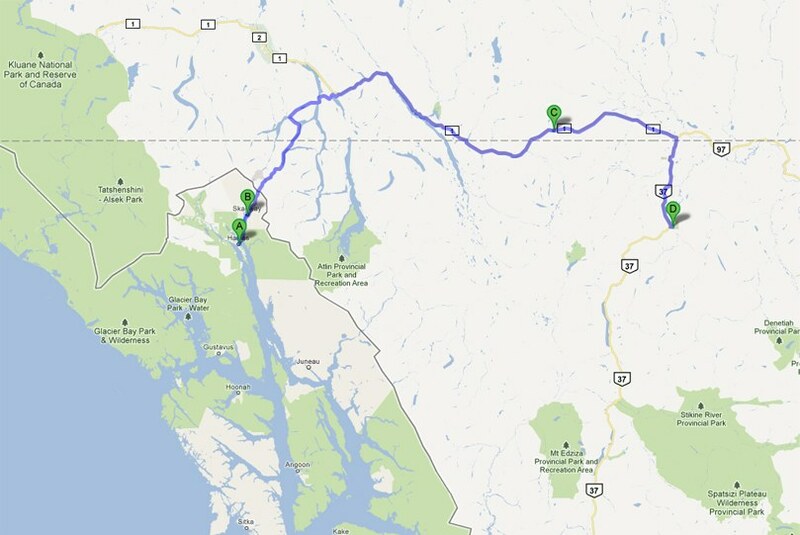 The Cassiar Hwy to Lake Louise and back to the U.S. It was about 34 degrees when we awoke at Boya Lake after a night of rain. Frost was on the picnic table and the van windshield. Boya Lake was so beautiful, in another season we would have stayed a week, but we felt a need to be on our way down the Cassiar-Stewart (hwy 37) then eastward on the Yellowhead (hwy 16) to Jasper and Banff National Parks. 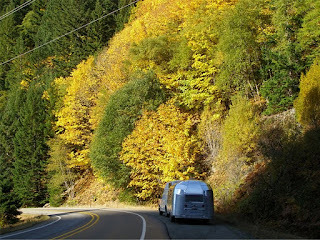 We packed up to head further south with hopes of leaving behind the cold, gray of winter and rediscovering autumn gold. We had many miles to go. 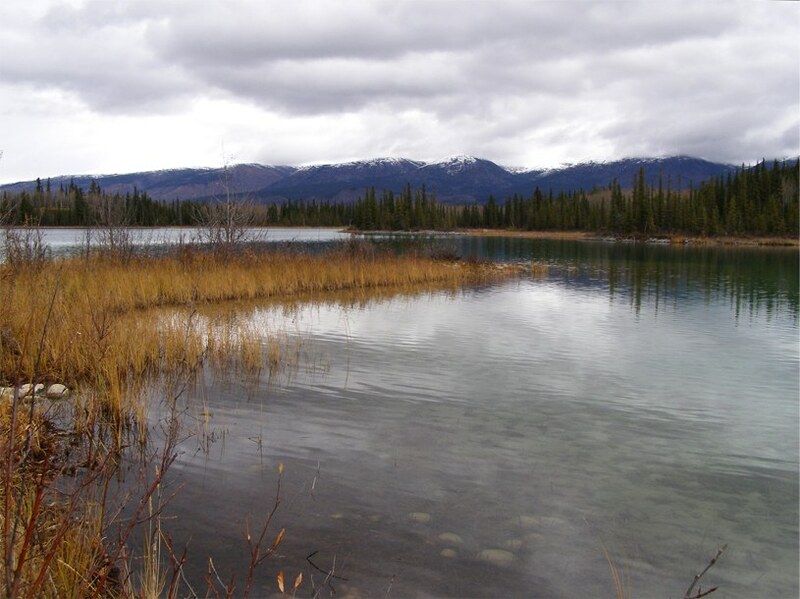 Scenery along the Cassiar stretch was especially beautiful. We saw many wood planked bridges in this region of British Columbia. We were curious to know why this material was used in such an ice-prone area instead of the steel grating we saw in other regions of the north. We never found out, so if anyone has the answer, let us know. Mile by mile the landscape grew more colorful. Aspen and roadside willows in orange and yellow, fireweed foliage a brilliant red. There were even late season wildflowers in bloom. We saw black bears munching on swaths of green grass. After a night boondocking roadside, we woke to dense morning fog. As we drove, the day continued overcast and damp. The Milepost guidebook informed us this region along the Stewart Hwy is totem pole country. Many Native villages have old totem poles still in place. We hoped to see some but time and weather conditions did not incline us to explore side roads. 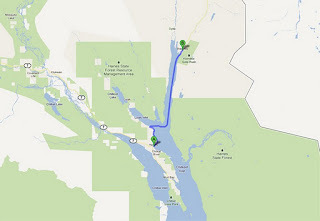 We were glad to come upon the Native reserve of Gitwangak, at the intersection with Yellowhead Hwy. Here the poles have been removed from original sites and gathered together in a row. The word totem is derived from the Ojibwe word odoodem, meaning “kinship group.” Totem poles are like signposts, telling stories and honoring heritage, their symbols primarily representing the clans each pole belongs to. Usually carved of cedar or spruce, poles were traditionally painted in black, red, brown and blue-green, using paint made of charcoal, cinnabar, iron oxide and copper oxide mixed with oil from salmon eggs. The poles are typically not maintained or restored. It is generally believed the deterioration of poles is representative of natural processes of decay and death. Another night of boondocking roadside. We woke to a sunny morning. As we travel eastward we return to “civilized” agricultural areas in the broad valleys of British Columbia. A classic BC farm scene. Would make a good painting. Nearing Jasper National Park we can see the high peaks marking the Continental Divide. Going south from the town of Jasper we drove the 230km long Ice Fields Parkway, noted for passing within viewing distance of seven icefields (large upland glaciers) and about 25 smaller but notable glaciers. 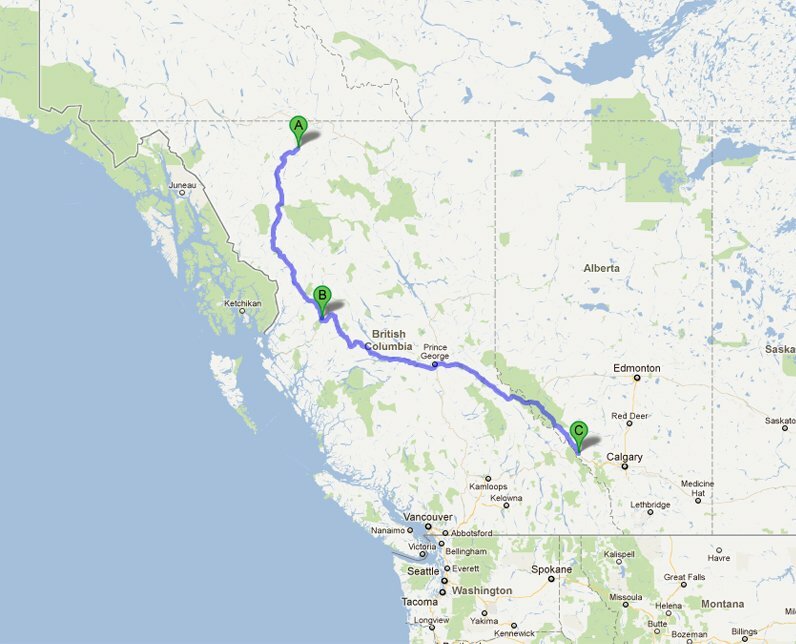 We then entered Banff National Park where we planned to stay at the Lake Louise campground. It was dark and very cold by the time we reached Lake Louise campground. 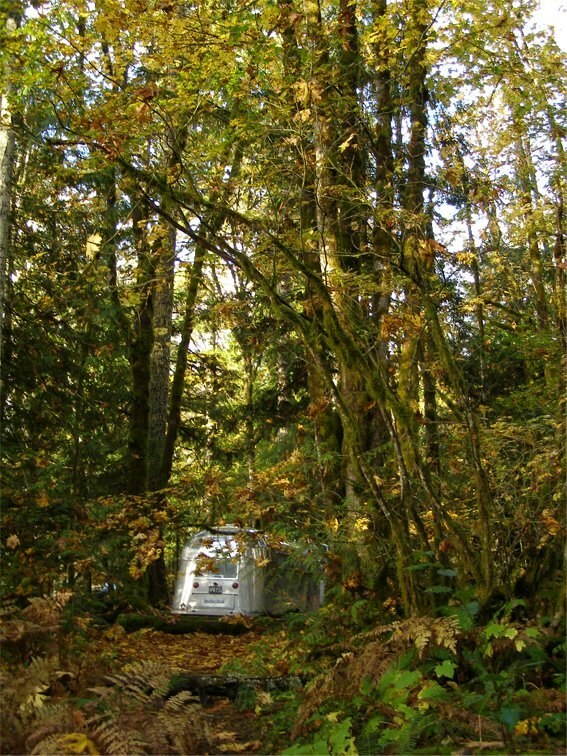 We were grateful to find electric hook-ups available though no water and no winter rate reduction. (Spike's U.S. National Park geezer pass did not help in Canada) however, hot showers and flush toilets in a heated restroom was a plus. We stayed two nights. waterfalls and turquoise colored pools. Though the day felt gloomy with overcast, such subdued light reveals interesting reflections in water such as these here at Emerald Lake in Yoho National Park. 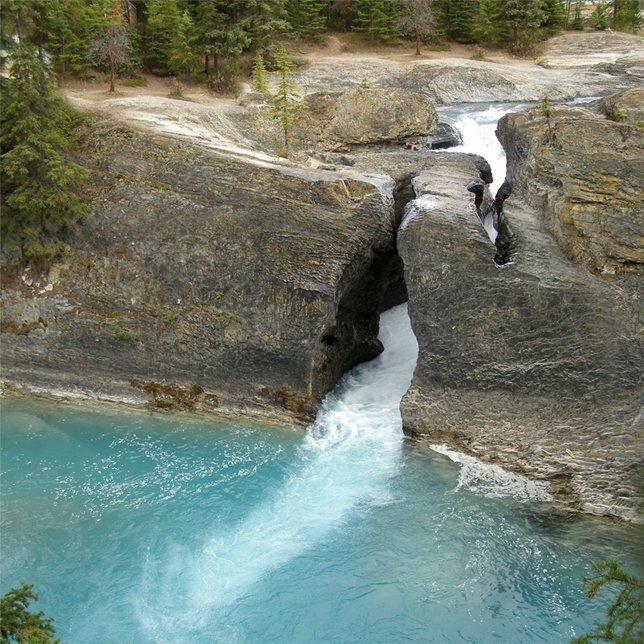 In this region six national parks are clustered close together, Jasper, Banff, Yoho, Kootenay, Glacier and Mt.Revelstoke. The $19.60 daily National Park pass is good for all six. 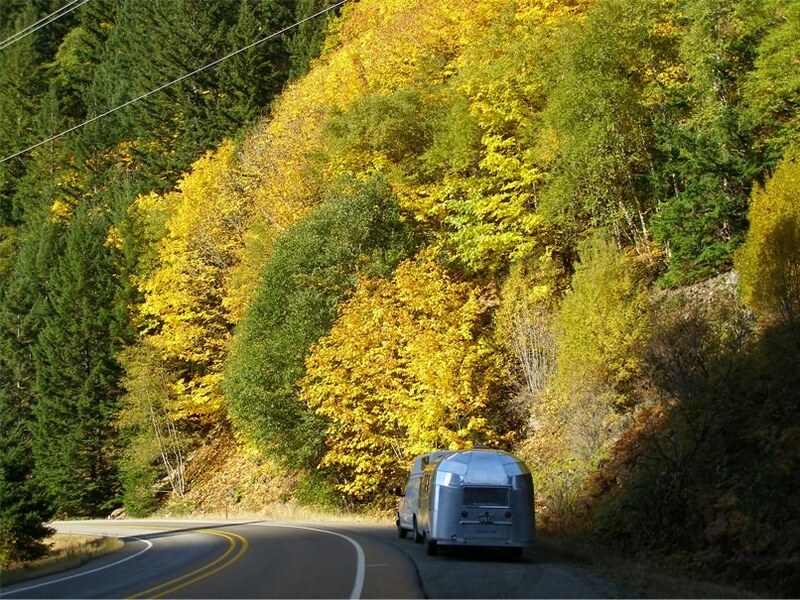 Unfortunately, in October most side roads, campgrounds and other facilities were closed. A bit of sun breaks through at picturesque Lake Louise the morning of our departure. After two nights in Golden we moved on to the city of Revelstoke where again, we found a nice municipal campground next to this beautiful small lake. Late afternoon view of wetlands along the Columbia River. The next day we were ousted by a city worker due to seasonal closing of the municipal campground. He suggested we move a short distance to a parking area next to the city ballfields, a beautiful spot beside the Columbia River. 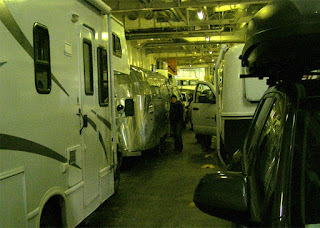 Once comfortably parked we noticed a sign saying no camping but we determined we were not “camping,” just parking overnight. No one seemed to object. It was raining on us nearly everyday at this point. We felt perpetually wet. Just like the trees, Spike sprouted a bit of witch's hair lichen on his face! LOL. Seeing old friends and making new ones. LtoR: Paul, Sue, Barbara, Spike, Ron. We took a welcome break from Airstream-living while visiting friends, Paul and Glenys Schorn, a couple we met 17 years ago on an Escalante Canyon back-country expedition. They have stopped by to see us in Utah a few times over the years. This was our fist opportunity to visit them at their beautiful home in a resort community near Vernon, BC. It's a gorgeous area of rolling hills and mixed vegetation similar to the wine country of California, and, in fact, it is called Canada's wine country. Our first evening there, neighbors Ron and Barbara were invited over for “nibbles” and wine. It was a fun evening of lively conversation and lots of laughter. Spike, Glenys and Paul with a painting by Spike. The Schorns are great art appreciators and supporters of living artists. Their home is filled with an eclectic collection of art and artifacts from their world travels. Note to friend Roger: remember the Grand Canyon painting that you saw on Spike's website and wanted to buy, but Spike couldn't find it? Here it is! Paul and Glenys bought it last time they visited us in Utah. Mystery solved. After a wonderful two days spent with the Schorns, we were on our way again. Midday we made our last international border crossing of the trip. 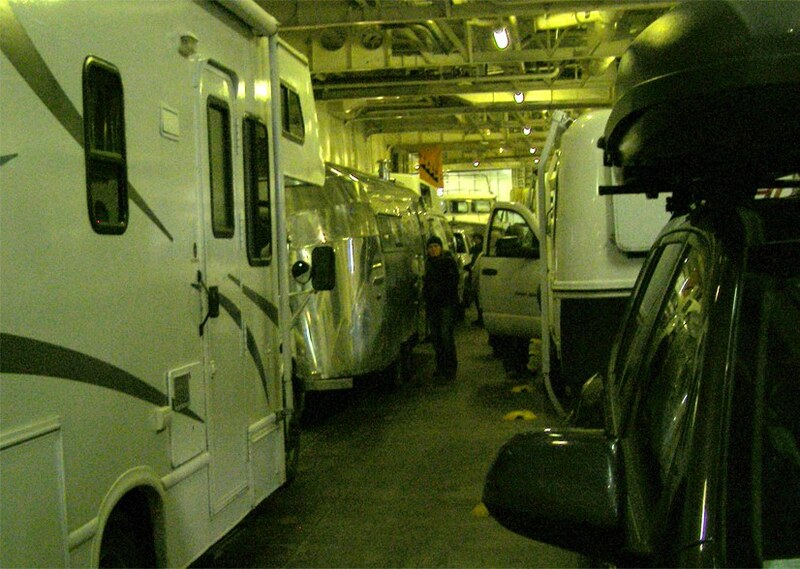 After a quick inspection of van and Moonshadow, U.S. Customs confiscated half a lemon and two limp green onions. 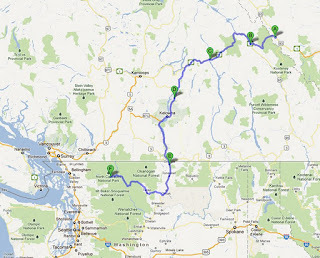 A friend suggested we visit North Cascades National Park in Washington state. 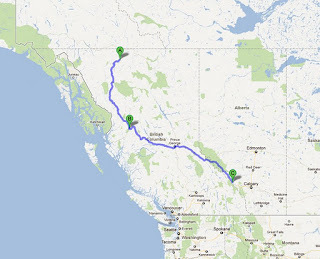 Since it was right on our route west to the coast, we made it our next stop. 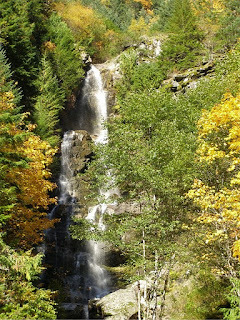 Along the way we drove through gorgeous forests of spruce, pines and golden larch. We encountered light snowfall on the summits and drizzling rain below. Campground after campground was closed for the season. It was dark by the time we found the one camp still open. 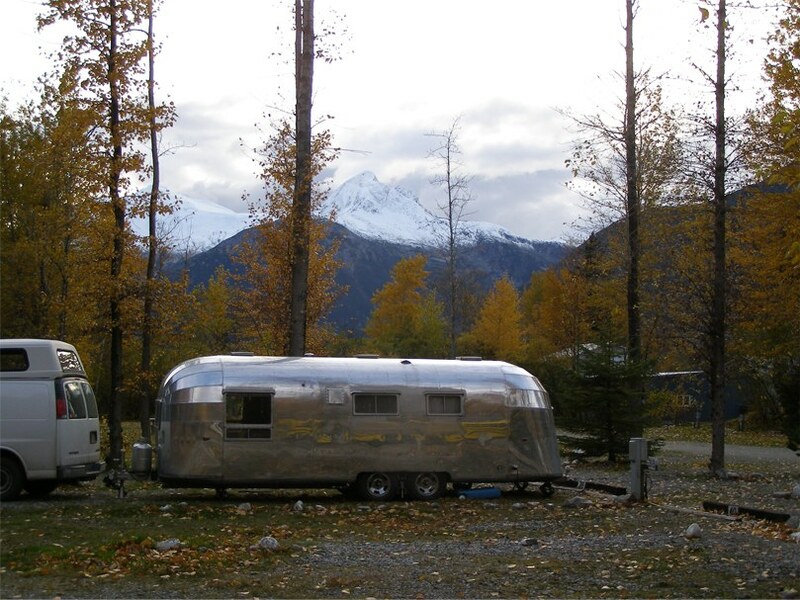 We didn't even bother to level the Airstream, just ate dinner and went to sleep. In the morning we discovered ourselves nearly swallowed up in a Disneyesque enchanted forest where you'd expect some magical creature to appear from behind a moss covered tree at any moment. We had a sunny day to explore the beauty of North Cascades National Park. Autumn color was at its peak in this area. 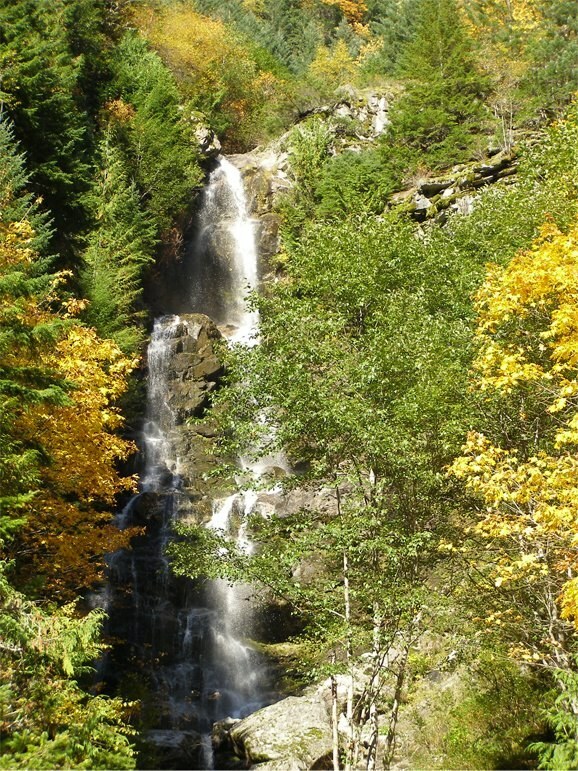 One of many cascades in the Cascades. From here we continued directly west heading for an area north of Seattle where we planned to visit friends and meet with, for the first time, another vintage Airstream lover who owns “Island Girl” a 1957 Caravanner. 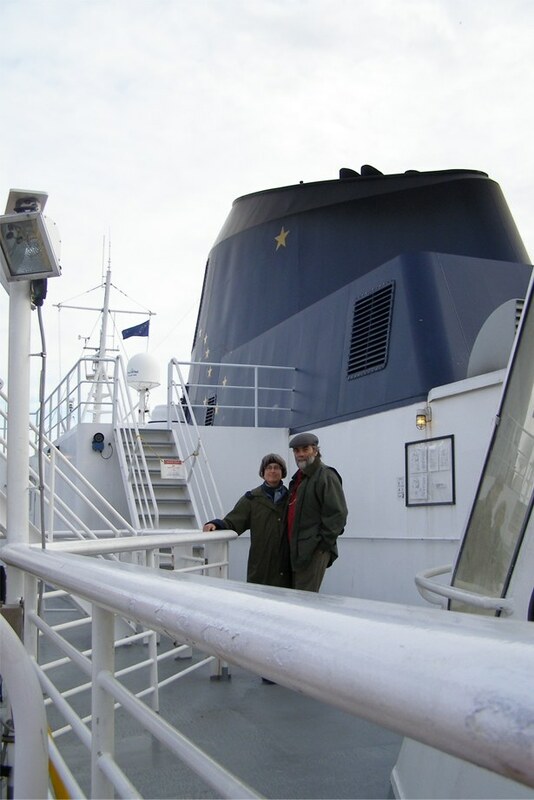 After getting advice from experienced Alaska travelers and studying the map, we decided to take the quick route from Haines to Skagway, travel by ferry. 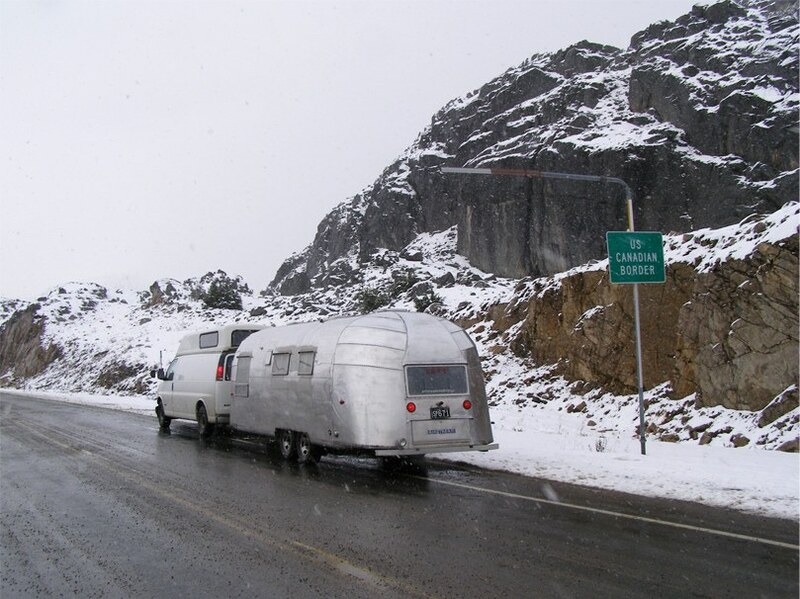 For our 47 ft. van and Airstream combo plus 2 passengers, the fare was $186, winter rate. We booked passage for Monday, October 10th on the Malaspina, a vessel large enough to carry up to 88 vehicles and 500 passengers. Though our departure time was 3:00 PM, it is required to check in early. 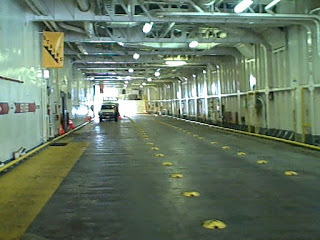 Since we had to be out of our RV park space by noon, we arrived at the ferry terminal extra early. They told us to pull to the front of lane eleven. There was plenty of time to make lunch and watch the other lanes fill up with cars. 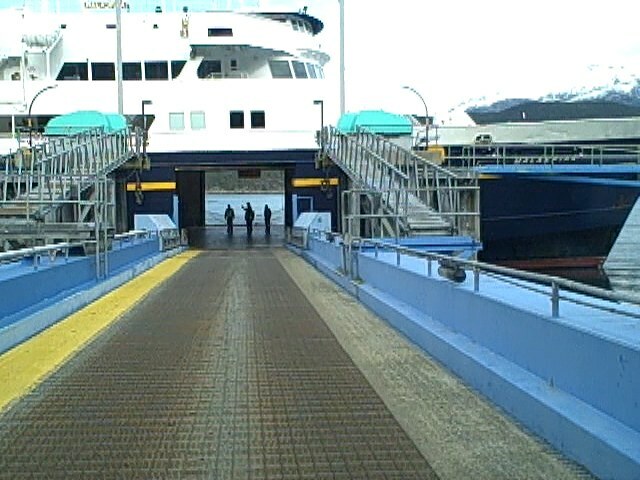 The Malaspina arrived and unloaded at 2:00. 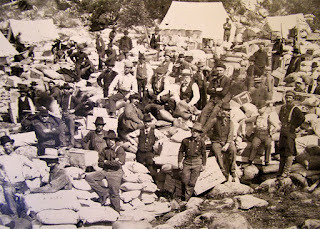 Reloading began at once. We were the first because of our size. ...20 minutes later, packed in like sardines. We retreat to the upper deck. We cruised across the wide Chilkoot inlet, then turned north up Taiya inlet. The wind grew fierce and icy. We sought the comfort of an indoor lounge with cushiony seats and big glass windows. After 30 minutes we could make out the buildings of Skagway lit up by sunshine. 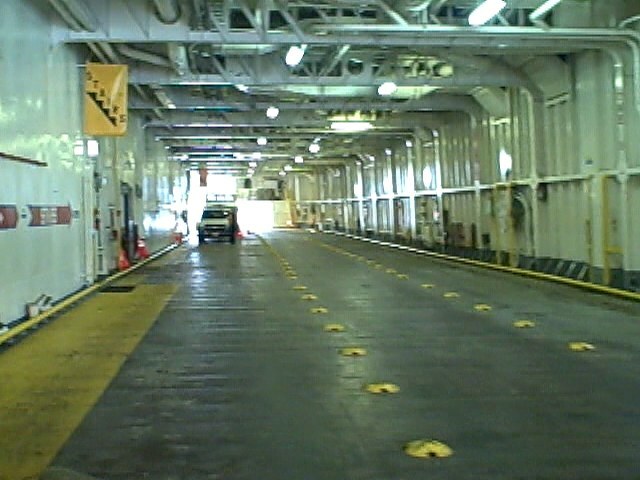 We were soon pulling up to the dock. First on, last off. After all other vehicles exited the ship, Spike was directed to back straight up into the bow. He had plenty of help from the ship's crew. As soon as he could, he made a hard left to exit the same door we entered. As we left the ferry terminal we headed directly to the Visitor Center a few blocks away on Broadway. 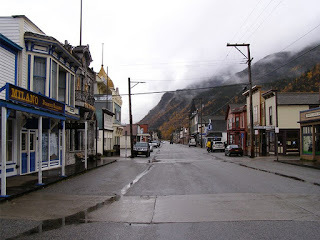 It was immediately evident, by the empty streets, that Skagway had shut down for the winter. It appears to be mostly a shopping stop-over for cruise ships. Cruising season was over. 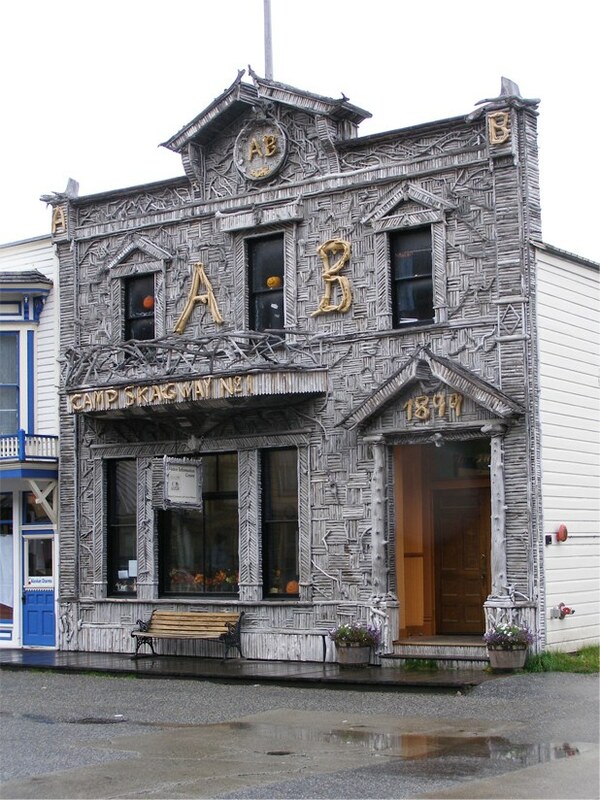 Though Skagway's quaint, historical charm has been preserved, the touristy aspect did not appeal to us. 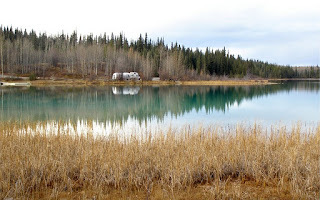 Because the coming winter necessitates turning off outside water, no RV parks remained open, but the host at the Visitor Center suggested one park where the proprietor might let us stay without hook-ups. We did make a deal for free parking in amongst the falling autumn leaves. We were alone there and cozy for two nights. The one thing we found interesting in Skagway was its history as the gateway to the Klondike gold fields No gold was ever found in Skagway Valley. 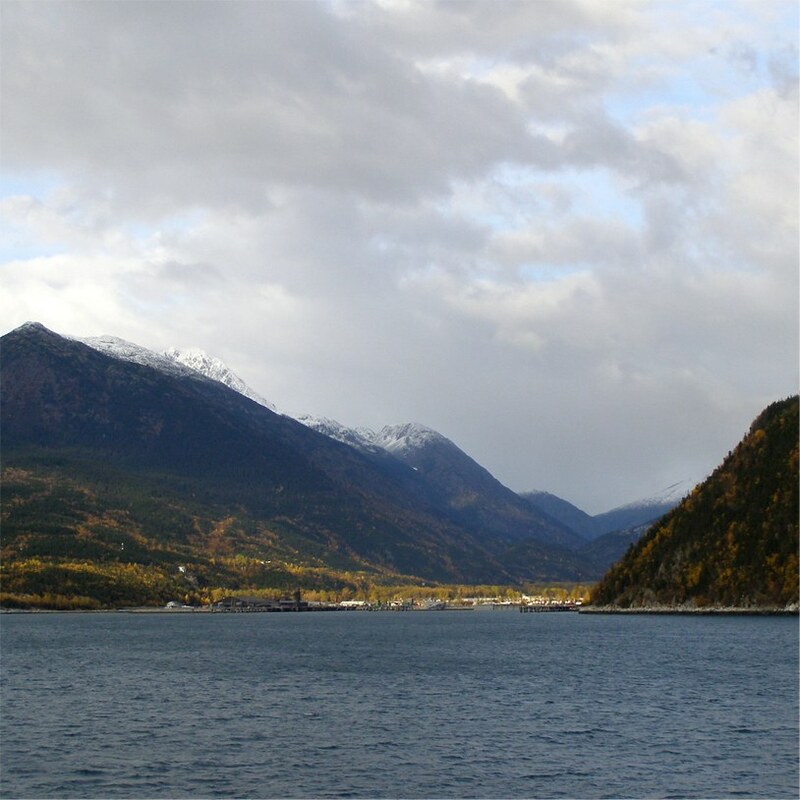 The gold fields were 600 miles to the north near Dawson City, in the Yukon Territory of Canada, but Skagway's harbor made it an attractive starting point for those sailing in from Seattle, then continuing on foot. An informative walking tour map can be picked up at the Visitor Center. Pictured here is the Arctic Brotherhood Hall, a fraternal hall with this amazing facade created in 1900. A battalion of lodge members collected some 8,883 driftwood sticks on the shores of Skagway Bay and nailed them up in an elaborate design. In 2004-2005 all 8,883 pieces of wood were removed. Forty percent had rotted and were replaced. Sixty percent were preserved and returned to their original position. 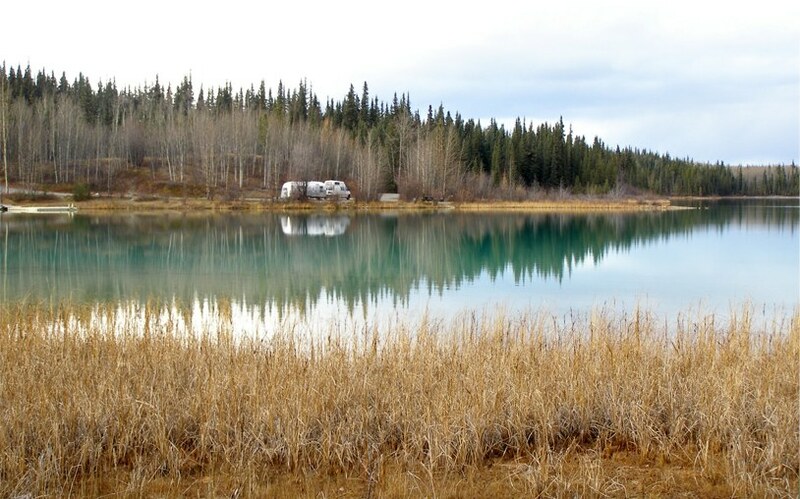 Among the few attractions still open in October was the Klondike Gold Rush National Historical Park. 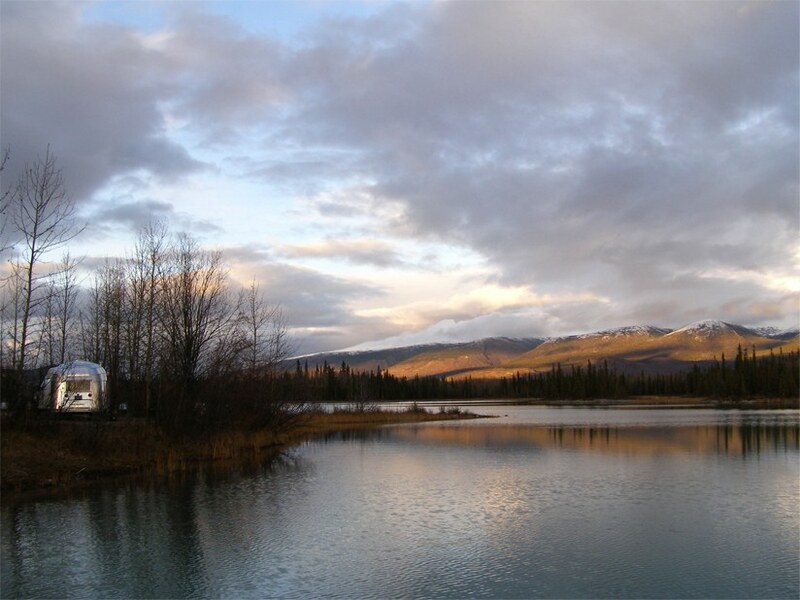 The park lands encompass all of the Chilkoot Trail area but the visitor center and museum are housed in Skagway. 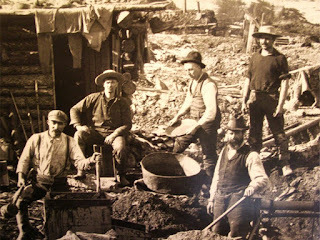 It's a small museum containing many fascinating gold rush era artifacts and photos with explanatory text panels. The photo above is Chilkoot Pass, circa 1898. 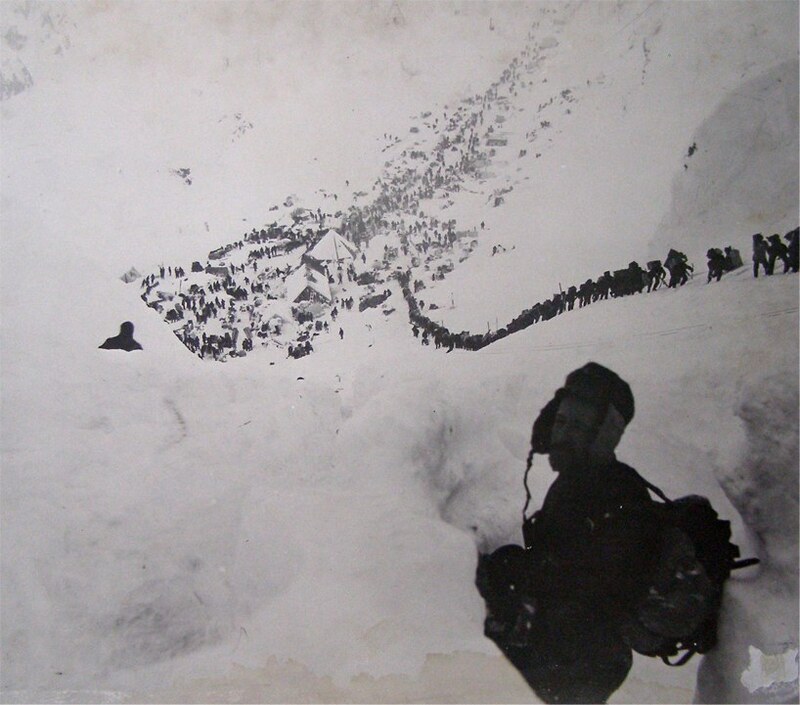 This hellish ¼ mile long staircase of ice was at the start of the 33 mile Chilkoot Trail linking this coastal part of Alaska to the Yukon River in Canada where gold seekers could then travel by boat on to the Klondike gold fields. Originally the Chilkoot Trail was a traditional Tlingit Nation trade route with its trail head in the Tlingit village of Dyea (pronounced die-ee.) The gold stampede brought over 30,000 gold seekers through Dyea between 1897 and 1900. When the rush was over, Dyea was gradually abandoned. In summer months hardy hikers can still walk the Chilkoot Trail. Not advisable in October. We took the 7 mile scenic drive from Skagway to the old Dyea town site. Bridge construction prevented us from going all the way but we saw harbor seals and harlequin ducks in the cove and investigated the nice National Park campground. Free camping after September 15. There was a reason they called it a “stampede.” The population of Skagway and Dyea exploded almost overnight. 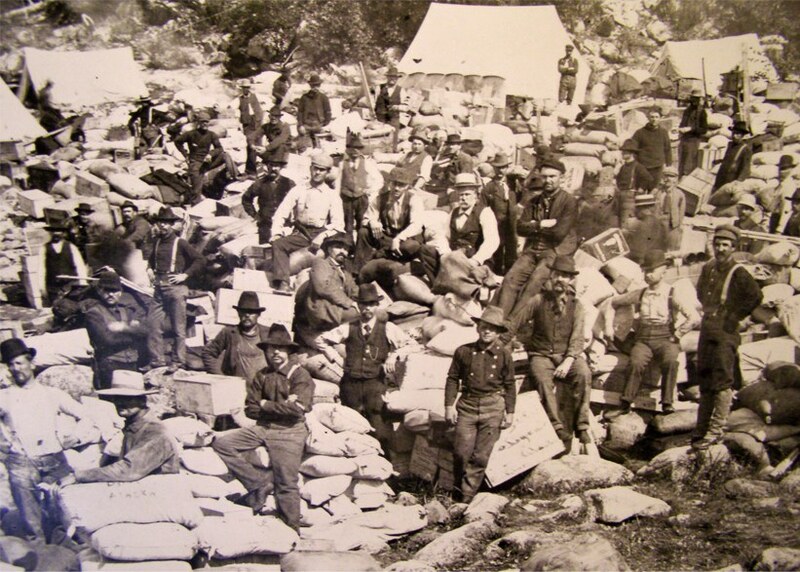 John Muir wrote “it looked like anthills someone stirred up with a stick.” Each stampeder was required, by the Canadian government, to carry a ton of goods – a year's supply of such things as flour, bacon, beans and sugar, tools, utensils, clothing, guns and ammo. It took most prospectors three months and 20 to 40 trips up the ¼ mile of steep steps to shuttle all their goods to the top. Life in Skagway, 1897-1899. Living on a diet of beans, bacon and bread with no fresh produce, scurvy was common due to lack of vitamin C.
Panorama overlook. 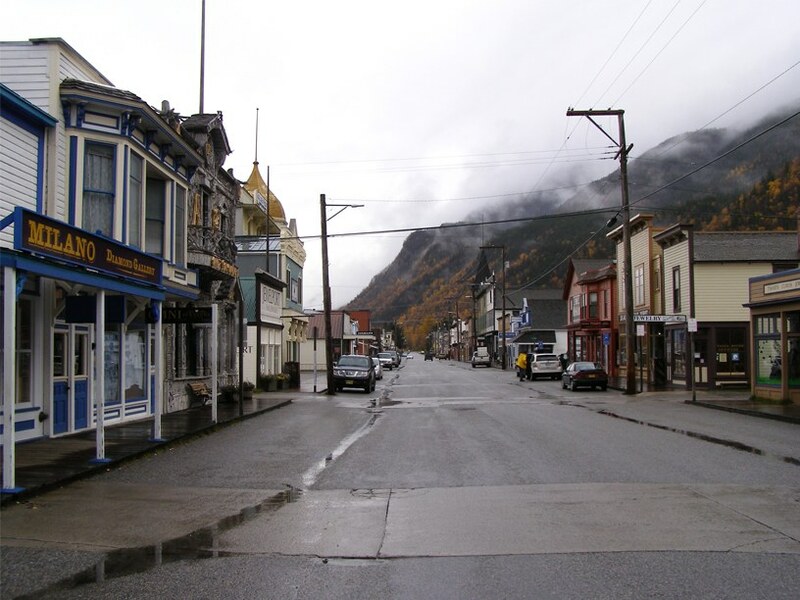 Skagway is a small town only four blocks wide and 22 blocks long. 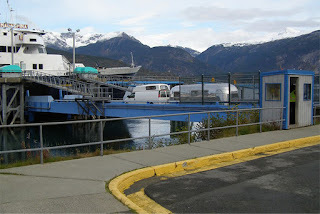 It has an airport runway up the north side and a big harbor welcoming cruise ships and ferry boats. In October the tourist shops were closed. Still open were shops catering to locals like the grocery store, a natural foods store, a hardware store, a small bookshop, a yarn and quilter's shop, a few bars, one gas station, the library and visitors centers. 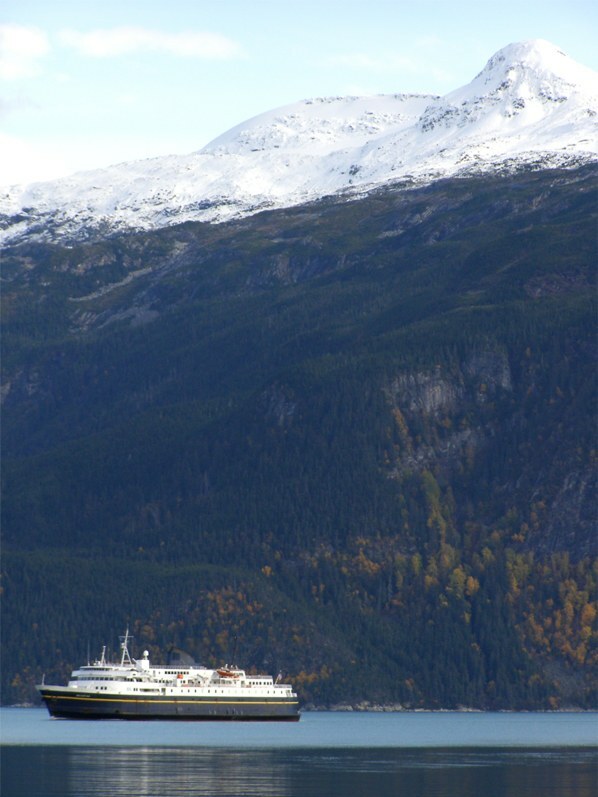 There has been effort to promote Skagway as a winter destination but we don't know where one would stay or what you'd find to do except ski and hang out at the bars. 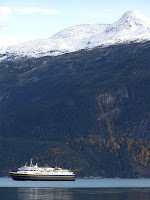 We departed Skagway on yet another overcast day but the drive still provided great scenery. Eleven miles north we crossed the Moore Bridge, an interesting 110 ft. cantilevered suspension bridge with only the south end anchored to rock while the north end merely rests on the opposite side. 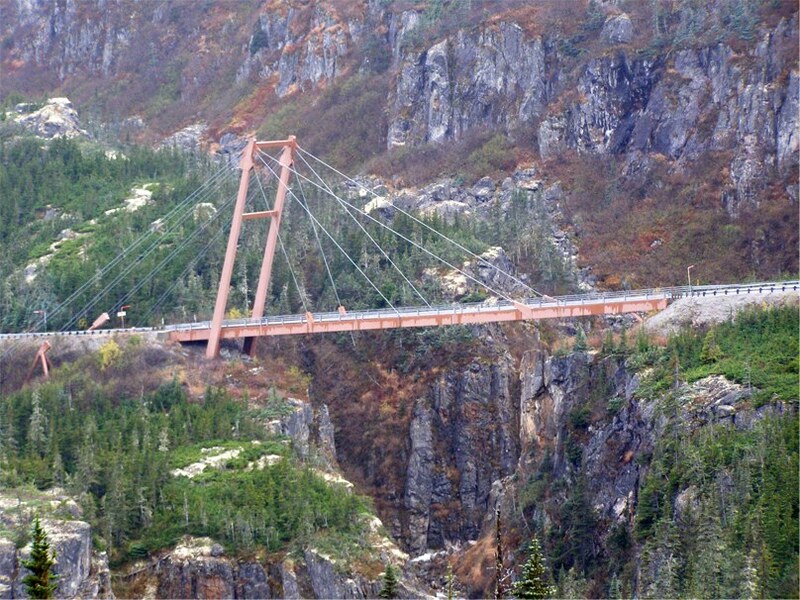 Since the bridge spans a geologic fault area, this design allows movement and prevents any fault shifting from destroying the bridge. This is one of only about a dozen such bridges in the world. We encounter the first light snow flurries of our trip as we cross into Canada again. Fellow travelers we met in Haines recommended a stop at Boya Lake along the Cassiar-Stewart Hwy in B.C., Canada. We arrived there at noon on the second day, after one night boondocking on the road. We had the entire campground to ourselves so we picked the best site with this scenic view. Bare aspen and birch trees warn us winter is right on our tail. Earlier that morning there were tense moments when we encountered icy roads. The afternoon brought sunshine. 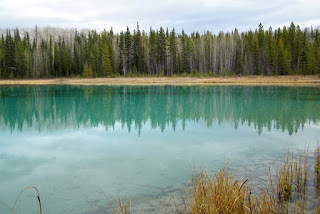 Sue took a short walk along the lake shore to enjoy the peaceful quiet and beauty of this turquoise lake. Boya Lake's water is crystal clear. The color is caused by light reflecting off the perfectly white bottom which is coated with a mixture of silt and shell fragments. The sun sets on our campsite. The next day we continued south on the Cassiar-Stewart Hwy.